Berries and summer seem to go hand in hand. And now that summer has arrived (hey, it was nearly 80 today in San Francisco! ), the markets are brimming with nature’s candy. Berries are everywhere. So, it’s fitting that this week’s #SundaySupper salutes this seasonal favorite. Nicole over at Daily Dish Recipes is hosting this week’s event, and I’m bringing a warm blackberry pie, topped with brandy-spiked whipped cream. Did you know there are over 2,000 varieties of blackberries? (The Oxford Companion to Food , 1999.) Who knew? Of course, we do know they’re loaded with antioxidants and other good stuff, making them a super nutritious fruit. In Northern California, blackberries grow wild just about everywhere. I remember my grandmother’s yard being lined with blackberries all along the perimeter, and sometimes it was a challenge to get them before passersby had snapped them all up. Apparently fruit growing along a fence becomes fair game. Fast forward a few years, while living in Sonoma, I was fortunate enough to have a large backyard filled with blackberry bushes, and that summer I found myself cranking out blackberry pies every weekend. Family and friends couldn’t get enough. 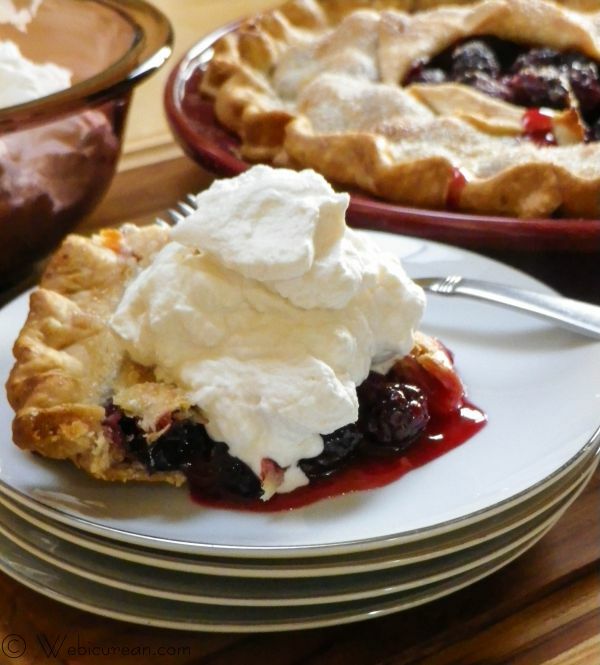 Throwing together a pie takes virtually no time, but picking those berries, well, that was a whole ‘nother story. Between wrestling with thorny branches and dodging bees, I was a bit relieved when berry season finally ended. I do miss those days, though… there’s something so satisfying about picking fruit from your own yard and dazzling everyone with a fresh pie a short time later. That’s what summer is all about. Thoroughly rinse and dry the blackberries. Place them in a bowl and toss with the lemon juice and vanilla. 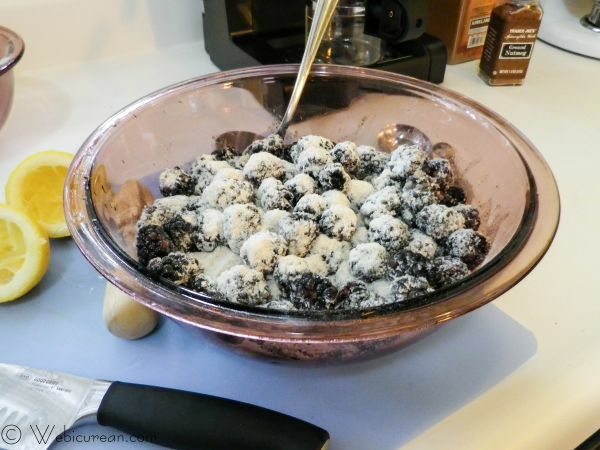 Mix the sugar, flour, cinnamon, and nutmeg in a small bowl, then toss with the blackberries. OK, you caught me, I cheated with a Pillsbury pie crust. If it makes you feel any better, even with the “perfect” pie crust, I managed to cut the steam vent off-center! So, you line the pie plate with the bottom crust. Pour in the blackberry mixture, giving a slight mound in the center. 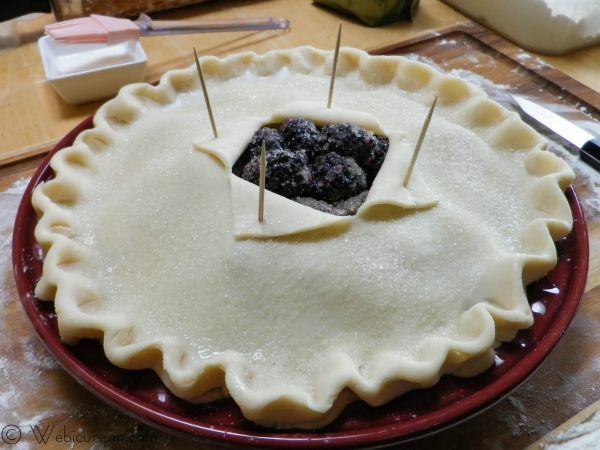 Then place the top crust over the berries, seal and crimp the edges, secure the folds with toothpicks, brush with milk, sprinkle with sugar, pop in the oven. PHEW. About 40-45 minutes later, you have a beautiful pie (that needs to be cooled). If you take long enough with the pictures, eventually your cat photobombs you. After circling his dish a few times, Jimbo decides to ignore me until I feed him. 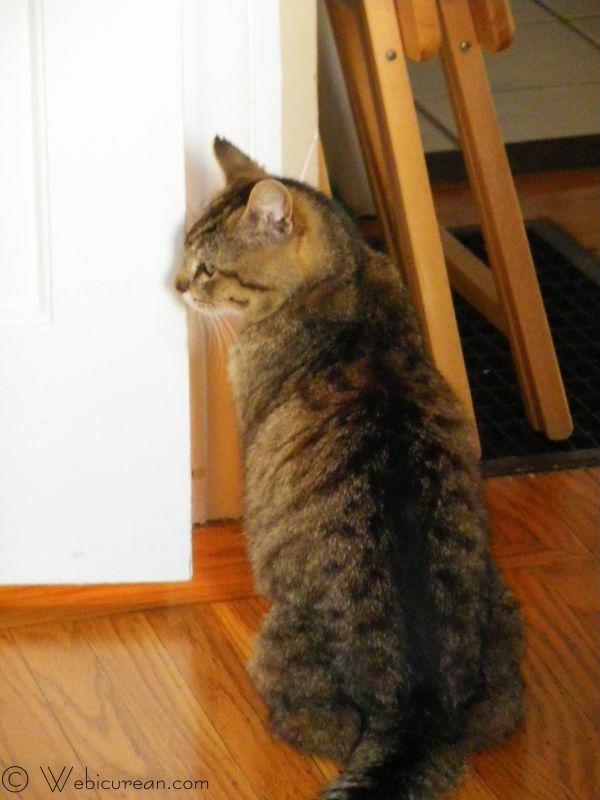 Unfortunately for Jim, the humans ate first. Bursting with fresh blackberries, this pie is perfect when topped with brandy spiked whipped cream. Roll out the first half of the pie crust, line the pie plate with it, and refrigerate. Thoroughly rinse and dry blackberries. Place blackberries in a large bowl, and sprinkle with lemon juice and vanilla. In a separate bowl, combine the sugar, flour, cinnamon, and nutmeg. Sprinkle over the blackberries and lightly toss. 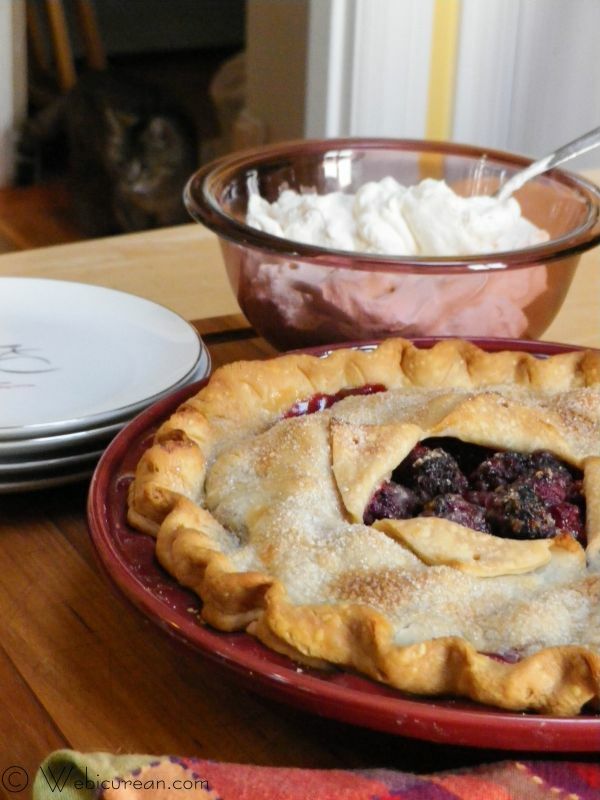 Pour the berries into the pie shell, making a slight mound in the center. Dot with butter. 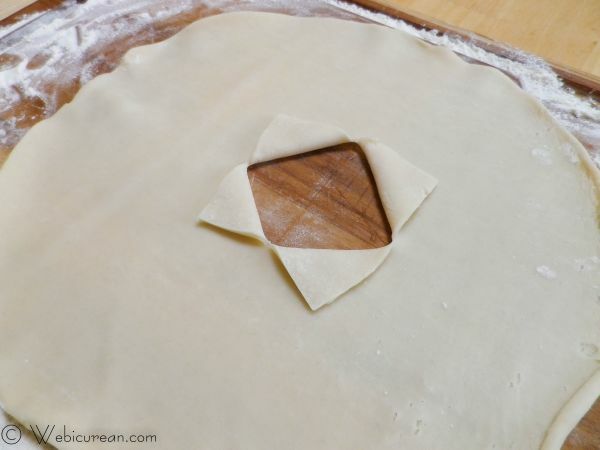 Roll out the second half of the pie crust into an 11-inch circle, and cut a 2-inch cross in the center. Fold back each corner, then place over the pie filling. Fold the edge of the top crust under the bottom crust, press together, and crimp as desired. Secure the folds with toothpicks. Brush the top crust with the milk, then sprinkle with the 1 tablespoon of sugar (or more if desired). Bake 40 to 45 minutes or until the crust is golden brown. Cool on a wire rack. Homemade whipped cream spiked with brandy. Add cream, sugar and brandy to a mixing bowl and beat on high until stiff peaks form. For best results, chill the mixing bowl and beater/whisk in the freezer for about 10 minutes before preparing. Look at all the berrylicious treats the rest of the #SundaySupper crew has cooked up! Chocolate-Raspberry Yoghurt Cookies byÂ What Smells So Good? Check back on Sunday for all of wonderful Summer Berries recipes! Weâ€™d love if you joined ourÂ #SundaySupperÂ chat on Â Twitter too: weâ€™ll tweet throughout the day and share all of our recipes. Then at 7:00pm EST weâ€™ll start our weekly chat. Please jump in anytime and join us! 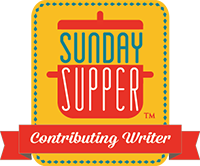 Â To join in, just follow theÂ #SundaySupperÂ hashtag, and remember to include it in your tweets. You can also check out ourÂ #SundaySupper Pinterest boardÂ for more delicious recipes and photos. Â Look what weâ€™re sponsoring! Come join us in sunny Orlando, this July! It was almost 80 degrees in San Francisco? Oh my! I didn’t think it every got that warm there. I would miss having all those blackberry bushes too. There are some that grow wild behind my house but I rarely walk out into the swamp to pick them. Too many critters out there. Just beautiful and the whip cream, oh my gosh! I want to eat it by the spoonfuls! Oh blackberries I love you so much….Looks fab! I have never made a blackberry pie, but blackberries are one of my favorite fruits, so I will have to give it a try this summer. My dad goes to the local berry farm and picks them for me – they are the best! Its beautiful and the whip cream Yummy! I wouldÂ´ve loved to be your neighbour in sonoma Anne! 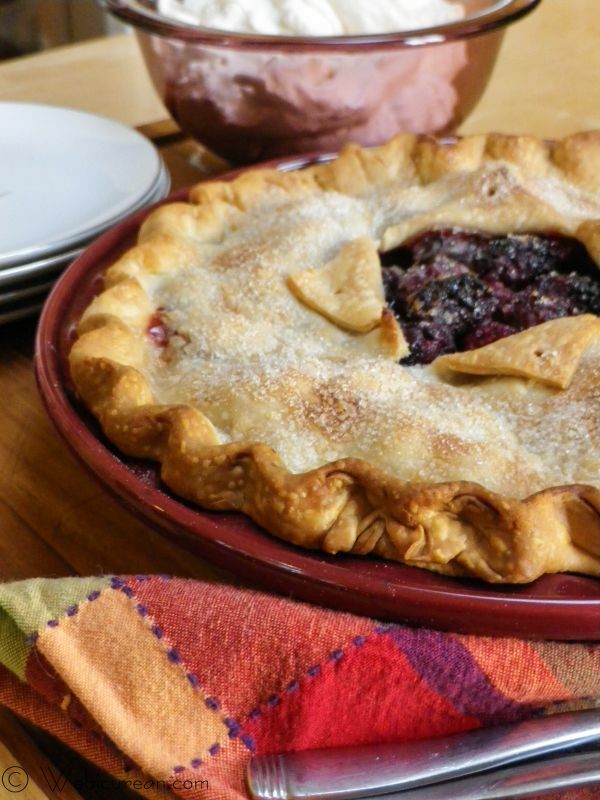 Double crust berry pies are such a treat, and blackberries in season are one of my favorites. It looks delectable! I donÂ´t blame the cat at all. Let me take a moment to pick my jaw up off the desk…I’m drooling all over it! Your pie looks like a golden crusted piece of perfection, but brandied whipped cream? That totally took it over the top in a good way! WANT! 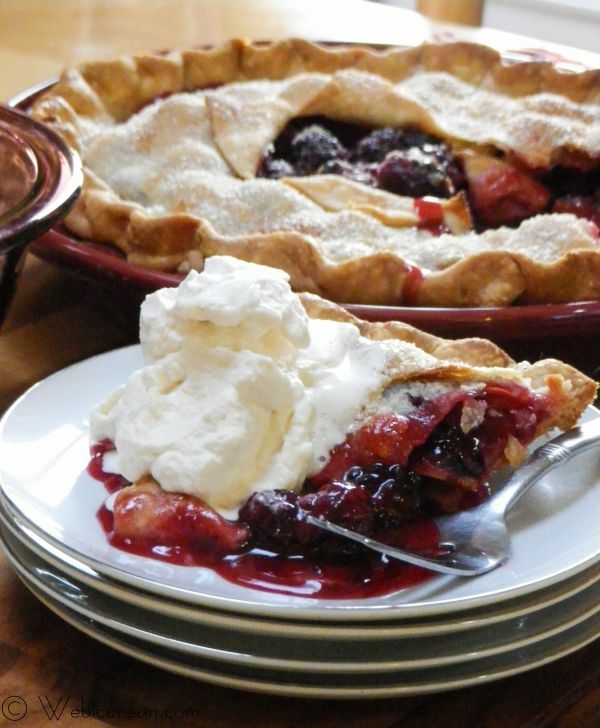 I adore berry pies…and blackberry ranks up there at the top! Yours looks exquisite, Anne, and I love your vent! Love, love, love berry pies!! I also love how you did the window, gorgeous!! Love your pie – if my pies looked that good, I’d make them all the time! Your pie looks great and I love the presentation. Adding the whip cream… Yum, looks amazing. Jane’s Adventures in Dinner recently posted..Guest Post Fun! I don’t have blackberries growing in my yard but thankfully here in the UK blackberries are a bit of a weed and grow everywhere. So we go foraging for them every year and blackberry pie is a standard dish we make. Now I have to try that incredible whipped cream of yours. I wish I had some blackberry bushes! 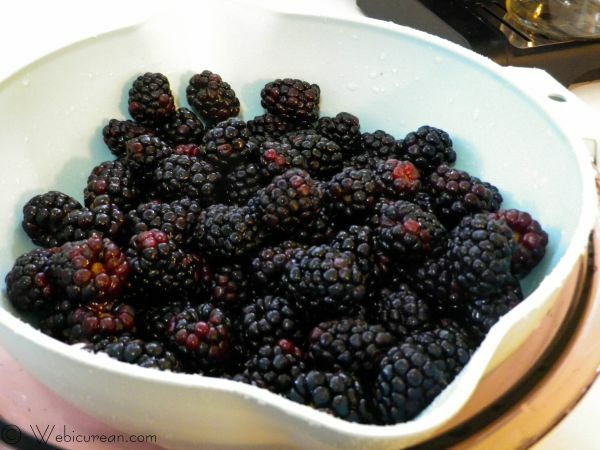 I DO have three big mulberry trees in my backyard, and I think that blackberries and mulberries can substitute for one another. My plan is too use as many of the berries as possible this summer, so I’m bookmarking this recipe so I’m ready to go! This looks absolutely lovely !!! Now if I baked this it would fall apart, but enjoying your pics ! Sounds yummy too ! sunithi recently posted..Coconut Shrimp Curry & Tips On Making A Great Curry ! Just made this pie OMG-A maze ing. Was my first double crust pie and it is to die for. Will make the whipped topping next time!! THank you. I made this for my boyfriend (only I made my own crust) and he absolutely loved it. He’s grew up on blackberry pies and him and his dad both swear up and down on the pie I made! Thanks so much! P.S. I’ve been looking forever to ‘re-find’ this recipe, I lost it (oops) such a relief to have it again!! So glad to hear you enjoyed it! Thanks for stopping by and letting me know!